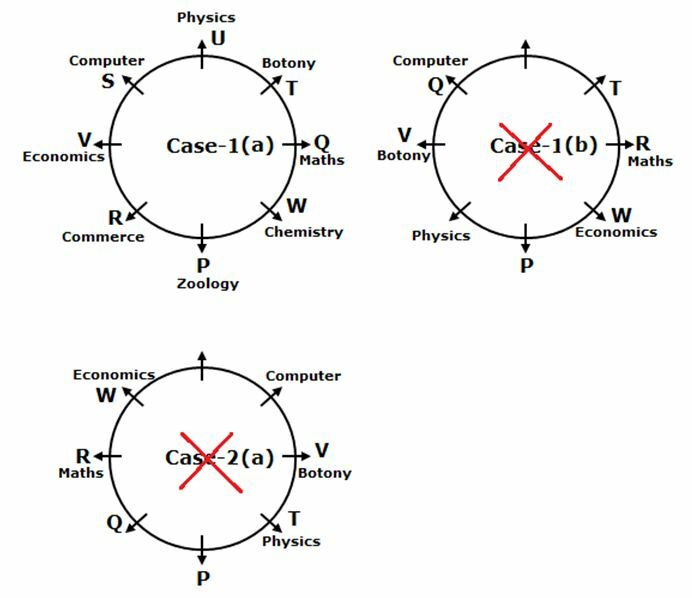 Eight persons P, Q, R, S, T, U, V and W are sitting in a circular table with equal distance from each other and all of them are facing away from the centre of the table. 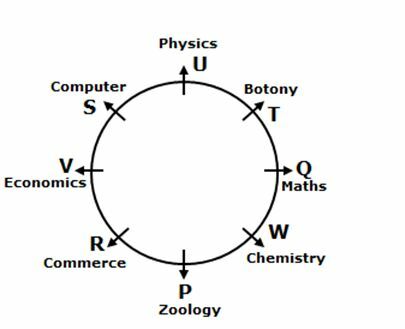 They all are like different subjects viz., Physics, Chemistry, Botany, Zoology, Computer, Economics, Maths and Commerce but not necessary in the same order. Two persons are sitting between P and the one who likes Computer. T sits second to the right of the one who likes Computer. The one who likes Botany sits opposite to R. The one who likes Economics sits immediate right of R. P and the immediate neighbours of P do not like Botany.V sits third to the right of W and sits opposite to the one who likes Maths. P does not like Maths. The one who likes Physics sits second to left of Q. R does not like Physics. As many persons sitting between U and the one who likes Commerce is same as the number of persons sitting between the one who likes Chemistry and U. The one who likes Commerce is not an immediate neighbour of the one who likes Maths. 1. Who among the following likes Chemistry? Two persons are sitting between P and the one who likes Computer. T sits second to the right of the one who likes Computer. 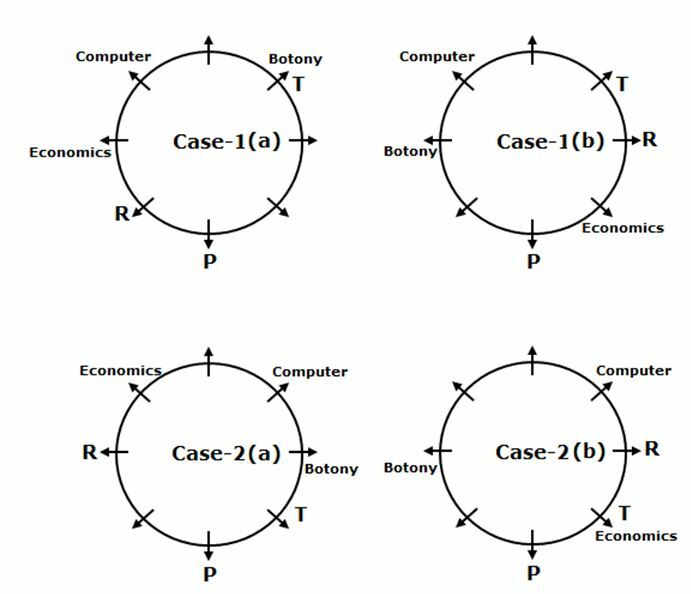 The one who likes Botany sits opposite to R. The one who likes Economics sits immediate right of R. P and the immediate neighbours of P do not like Botany. V sits third to the right of W and sits opposite to the one who likes Maths. P does not like Maths. The one who likes Physics sits second to left of Q. R does not like Physics. As many persons sitting between U and the one who likes Commerce is same as the number of persons sitting between the one who likes Chemistry and U. The one who likes Commerce is not an immediate neighbour of the one who likes Maths. 2. S likes which of the following subjects? 4. If R is related to Maths and T is related to Economics in a certain way. Then, P is related to which of the following? 5. How many persons are sitting between the one who likes Maths and S, when counted from the left of S? ‘P-Q’ means ‘P is sister of Q’. 6. Which of the following statements is true if the given expression ‘J÷T×K-M+O’ is definitely true? 7. Which of the following expressions represents ‘D is mother of F’? 8. How is ‘I related to A’ in the expression ‘A+B-C×I’? Kumar walks 5m towards south and reaches point U from point T. Then, he turns his right and walks for 4m to reach point V. Now he turns to his left and walks for 8m to reach point W. Then he turns to his left and walks for 6m and reaches point Q. Finally he took a left and walks for 4m to reach point R.
9. 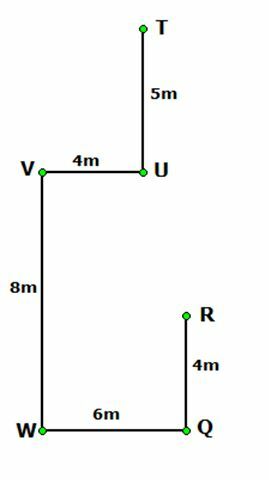 What is the shortest distance between point U and W? 10. What is the direction of point R with respect to the point T? 1) Who among the following likes Chemistry? 2) S likes which of the following subjects? 4) If R is related to Maths and T is related to Economics in a certain way. Then, P is related to which of the following? 5) How many persons are sitting between the one who likes Maths and S, when counted from the left of S? 6) Which of the following statements is true if the given expression‘J÷T×K-M+O’ is definitely true? 7) Which of the following expressions represents ‘D is mother of F’? 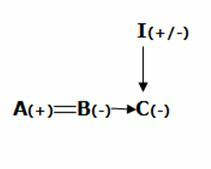 8) How is ‘I related to A’ in the expression ‘A+B-C×I’? 9) What is the shortest distance between point U and W? 10) What is the direction of point R with respect to the point T?